She is now working on a 5,600-cupcake installation of Obama and President Abraham Lincoln for the Smithsonian American Art Museum that will be on display Feb. 14. It started as a crazy love poem in food dedicated to an amazing candidate, and then donated to his local volunteers in Buffalo, NY. Thanks to the incredible press and overwhelmingly positive response, cupcake portrait installations have now become my own unique form of edible art that are equal parts installation, performance, homage, and dessert. I'm pleased to be able to offer these portraits now for purchase. Booking up to two years in advance, I cater to individuals as well as corporations and organizations. The smallest portrait I offer is 5' x 6', made from 1200 cupcakes, serving 200-400 people. Pricing starts at $6,000 plus travel expenses. Coming soon: my next cupcake installation! Stay tuned...The Late Show with David Letterman has asked me to submit a video showing an installation of their stage manager Biff Henderson in cupcakes. In early January I will send in my audition tape...fingers crossed...wish me luck! Artist and baker Zilly Rosen’s medium of choice isn’t paint or clay; she prefers flour, frosting, and fondant. 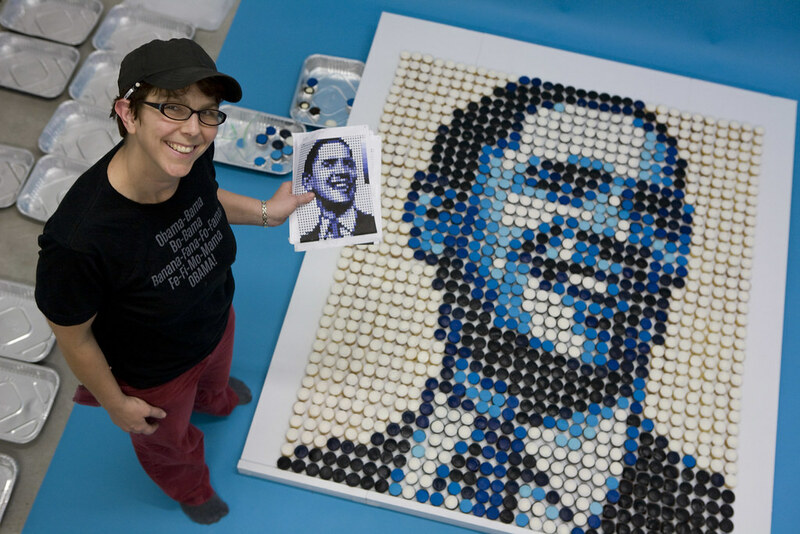 In honor of Presidents’ Day, Zilly will create a portrait, A New Birth of Freedom, made entirely of cupcakes, which celebrates President Barack Obama’s inauguration and the 200th anniversary of President Abraham Lincoln’s birth. View Zilly’s temporary installation, comprised of more than 5,000 cupcakes, from noon until 5 p.m. from the mezzanine levels of the museum’s Luce Foundation Center. Following the Presidential Family Fun Day festivities in the Kogod Courtyard, take part in the de-installation of this piece by sampling a cupcake. This presidential portrait is not only distinguished but delicious! Oh wow! That's crazy cool! That's so creative. Not only motivating...delicious too! 1200 cupcakes serving 200 people? Thats half a dozen EACH! That is some portion! Thanks for the write-up Rachel! I was going to send you the info but you have found it first, clever lady. In response to Katie's comment above, the cupcakes are teeny mini-cupcakes, not large cupcakes. 6 is a large dessert portion; 3 is more of a light "tasting." They are like cupcake poppers...they go down like butta. And you can freeze the leftovers!